This post is sponsored by PSECU, a Pennsylvania-based credit union. As always, all opinions are my own. If you’ve got a house full of things that you hold onto just in case, thinking you’ll fix it someday or you might use it…eventually, then you’re not alone. We live in a culture that revolves around STUFF. So much stuff. We work our lives away just to buy more stuff, and we don’t really like parting with the things we already have. But that’s where minimalism comes in. Turn out, minimalism, or learning to live without all the ‘stuff’ is good for more than just your wallet – it can be good for your mental health, too. So how can minimalism help you find clarity? Let’s talk about that. Researchers at UCLA found that mothers experienced additional stress when having to deal with their belongings or the things that belong to their children or husband. Specifically, these moms experienced a spike in their stress hormones when having to deal with clutter. Your mind reacts to clutter the same way it does if you’re trying to multitask – you get overwhelmed by all the things in front of you and it stresses your brain out. Even if you try to keep your house clean, you’ve probably got a whole lot of clutter. It might be a pile of bills, or a stack of magazines that you’re never going to read again, or a dresser full of jeans that are one size too small because you’re trying to get back down to that size (GUILTY). But having too much clutter in your room isn’t just a pain when it comes time to do some spring cleaning – it can also have a negative effect on your productivity and mental health. So check out this infographic, because it’s super helpful. PSECU created the graphic below with steps on how to become a minimalist. If you have a lot of belongings, learning how to declutter or become more minimalistic can be a bit of a daunting task. How do you decide what stays and what goes? Well, here are a few ideas. Turn Off Your Notifications – Clutter isn’t just physical. Digital clutter can be just as problematic. You have to switch between all sorts of different things, and that can just jumble your mind. Go Paperless – We’ve all got a pile of mail and bills somewhere. Going paperless, at least for your bills, bank statements and credit card statements, can help reduce the clutter. You can even transition things like banking and bill paying to an online format. If you’re in Pennsylvanian, you may be eligible to join PSECU, which offers mobile payments, apps, online banking, bill payers and more! One Room at A Time – Don’t try to tackle all the clutter in your house at once – you’ll just get overwhelmed and end up giving up. Focus on one room at a time. Even part of a room, if the job seems too big – start with your closet or your desk and then move on to the rest of the room. Disassociate – One of the biggest obstacles to decluttering your home is the sentimental attachment that we put on our belongings. If you can disassociate yourself from some of those emotions, decluttering becomes much easier. Once you get rid of some of the clutter, the next step is a lot easier. The point of minimalism as it pertains to clarity is this – decluttering is one of the best ways to help you clarify what you really want in life. Have you always wanted to move to another country or even just across the country for a job opportunity but didn’t because you had a house-full of belongings tying you down? Worried about missing a bill payment because the paper bill got lost in the clutter? Maybe you just want to simplify your life and get rid of some stuff that’s tied to bad memories. Byeeeeee old boyfriends! 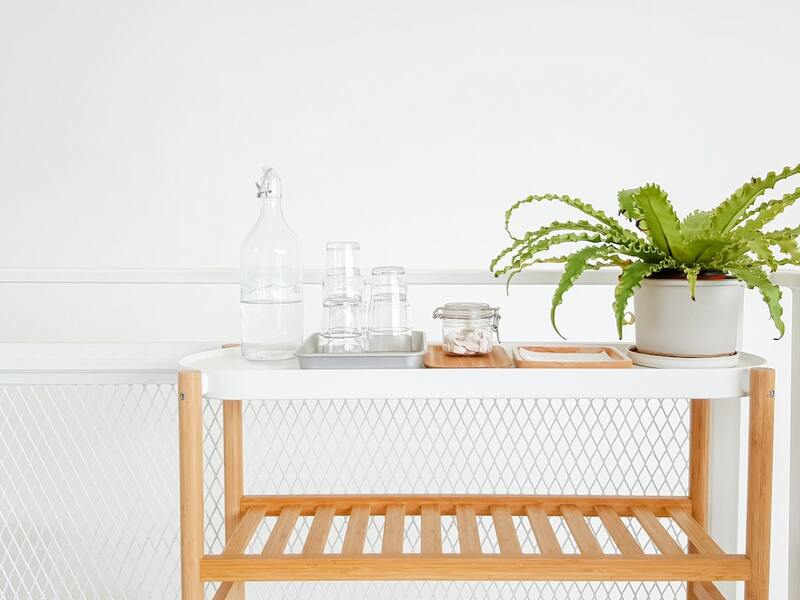 Whatever your reason, minimalism is a great way to get your life back in order – both literally and figuratively – and turn your cluttered house into a place that you’re happy to call home. So that’s it! What do you guys think about minimalism? Do you guys have a hard time decluttering? Let me know down in the comments! I feel like there’s a big difference between decluttering and minimalism – one is definitely a good idea for everyone to do and the other is something that requires a fair amount of privilege in life to obtain. I invite you to read up on why minimalism doesn’t or can’t work for low-income families, it’s very eye-opening.